An absolutely outstanding Japanese Maple Outdoor Bonsai (Acer palmatum kashima) approximately 50 years in age. It is breath-takingly beautiful with outstanding root flare and trunk character. 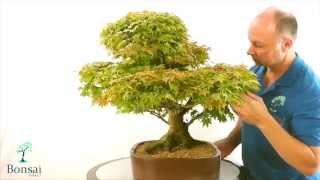 Please take a look at the video beneath the main image - the photographs simply do not do this bonsai justice - it has it all. Large mature canopy of wonderful palm-shaped leaves which change colour throughout the seasons. Fablous root structure, incredible trunk character, beautiful branches. Potted into a classic unglazed ceramic bonsai pot. An inspirational bonsai for the discerning! Delivery is free to most areas and you may select the best delivery date on the calendar at the checkout. All bonsai are very carefully packed in bespoke packaging. This is an absolutely outstanding Japanese Acer Bonsai. The detail in the nabaryi and trunk is beautiful. The trunk is powerful and exhibits character and huge artisitc appeal, the photographs simply do not do this bonsai justice. The root spread and detail gives power and aged appeal. The canopy is beautiful tinged with reds and greens. Bonsai Pot: Unglazed recatngular ceramic bonsai pot with rounded corners. A bonsai classic. Fantastic spring and autumn foliage, displaying reds, yellows, oranges and greens throughout the growing season. They require a sheltered position in the garden protected from strong winds. When pruning please allow 1-2cm for die back and do not use wire to style your maple as the bark is very delicate and scars easily. A truly beautiful bonsai.